About 100 people have been killed in a landslide as they picked through mountains of waste rubble in a remote mining area of northern Myanmar searching for precious jade, state media has reported. 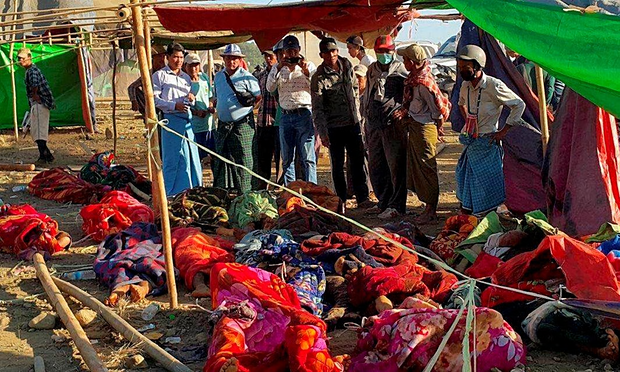 Those killed were thought to have been mainly itinerant miners, who make a living scavenging through mountains of waste rubble dumped by mechanical diggers used by mining firms at the centre of a secretive multibillion-dollar industry in the restive Kachin state. Saturday’s massive landslide crushed dozens of shanty huts clustered on the barren landscape and which were home to an unconfirmed number of people. The disaster happened at about 3.30am local time (9pm GMT) and lasted just a couple of minutes, according to Zaw Moe Htet, a local gems trader whose village overlooks the devastated area in the Hpakant mining area. “Even people living in villages further away could hear the cries of those who rushed to the scene,” he said. Video footage of the area shot on Saturday shows men carrying several bodies slung in blankets watched by a crowd of local people in a dusty plain near the village of Sai Tung. Nilar Myint, an official from the local administrative authorities in Hpakant, said rescue teams have so far found 97 people killed in the landslide. Landslides are a common hazard in the area as people living off the industry’s waste pick their way across perilous mounds under cover of darkness, driven by the hope they might find a chunk of jade worth thousands of dollars. Scores have been killed this year alone as local people say the mining companies, many of which are linked to the country’s junta-era military elite, increase their operations in Kachin. Myanmar is the source of virtually all of the world’s finest jadeite, a translucent green stone that is prized above almost all other materials in neighbouring China. In an October report, advocacy group Global Witness estimated that the value of jade produced in 2014 alone was $31bn (£20.4bn), the equivalent of nearly half the country’s GDP. But that figure is about 10 times the official $3.4bn sales of the precious stone last year, in an industry that has long been shrouded in secrecy with much of the best jade thought to be smuggled directly to China. Local people in Hpakant complain of a litany of abuses associated with the mining industry, including the frequency of accidents and land confiscations. The area has been turned into a moonscape of environmental destruction as huge diggers gouge the earth looking for jade. Itinerant miners are drawn from all parts of Myanmar by the promise of riches and become easy prey for drug addiction in Hpakant, where heroin and methamphetamine are cheaply available on the streets. “Industrial-scale mining by big companies controlled by military families and companies, cronies and drug lords has made Hpakant a dystopian wasteland where locals are literally having the ground cut from under their feet,” said Mike Davis of Global Witness, calling for companies to be held accountable for accidents. The group wants the jade industry, which has long been the subject of US sanctions, to be part of the Extractive Industries Transparency Initiative (EITI), a global scheme designed to increase transparency around natural resource management.